I THINK I MIGHT BE COMPETENT ENOUGH TO DO THIS. 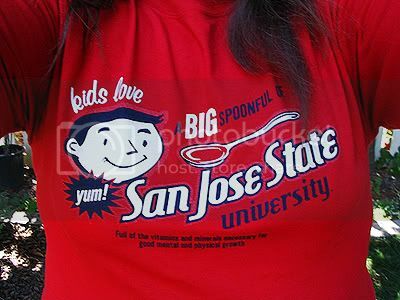 That shirt actually makes me kind of proud to go to SJSU. Awesome. I AM OFFICIALLY A COLLEGE STUDENT AND A COMMUTER. wtf. Who's getting their face trimmed tomorrow? I swear, there are things living in his puppy beard. And the fur above his eyes is so long that most of the time you can't even tell he HAS eyes anymore. I'm Roxie, and I approve this entry. nice shirt, and I guess college/ Universitiness is like medicine! You should go into marketing for SJSU, you could appeal to a whole new crowd! I am so jealous you guys are all ready in school and all, pout. Yay kolledge can be phun! That is a nifty kitschy t-shirt. I'd definitely be proud to wear it. Yeah, I kind of got that feeling. Then again, I didn't become cynical about high school until the middle of senior year, which is longer than many of my peers. We'll see what happens. I'm just weird, I think. I do get very cynical when I'm in love, though. I guess that's kinda natural. Re: I do get very cynical when I'm in love, though. I guess that's kinda natural. Haha, pipeband! I like that. Aww, I'm sorry! There's a big art department at my school, so maybe they have students designing them or something. It looks like he somehow got dirt/gum stuck in his fur, which is weird because no one in my house chews gum. Magical wizard puppy. Getting a facial trim sounds frightening. I guess if you're a dog it's maybe not as bad. But still, scissors? Near the eyes? Scary. 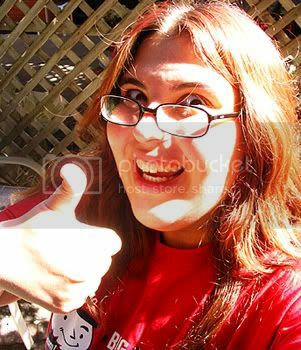 And hahah from that picture it looks like you don't just APPROVE the entry but like...INSANELY MADDENINGLY APPROVE IT!! 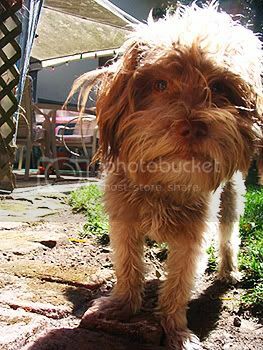 That's why grandma always hesitates to get his fur cut, but it's getting to the point where his head is turning into one giant furball. It is a word! And yes, it's true. I am crazy for this entry.